Last night was Sony's turn to offer a glimpse inside its Pandora's Box of forthcoming PlayStation-related hardware and software, with an E3 presentation high on traditional gaming thrills that rather crushed Microsoft's attempt at selling us a glorified webcam. The company's main opening thrust was the imminent mass arrival of 3D games on PlayStation 3, with the possible combination of PlayStation Move and 3D gaming putting you "Physically in the game itself" according Sony's Kaz Hirai. Imagine that. A list of forthcoming 3D PS3 games was reeled out numerous times throughout the presentation, but the clear winner was Killzone 3. 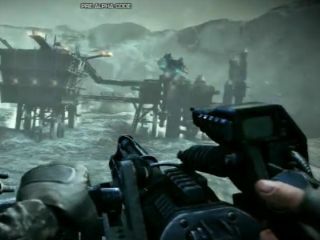 The developer of Killzone 3 promised the crowd the game was built with 3D in mind from the "ground up" - rather than having 3D effects crudely stuck in because it so happens to fit in with 2010's hottest TV technology micro-trend. The video demo didn't really live up to that promise, to be honest, with a visually intense but rather standard-looking shooter unfolding. Dropships flew in, aliens attacked, men covered each other and begged for "evac" while the audience cheered for the crazy jetpack-based combat sections. It looked suitably epic and impressive, but what well-produced, Triple-A software product doesn't these days? Killzone 3 release date is Feb 2011 including PlayStation Move motion control support from launch, if you're into the whole clapping your hands and blowing raspberries business. And it was PlayStation Move that was the second thrust of Sony's E3 conference, with the company wheeling out a list of developers to back up the precise, 3D nature of the motion device. Sony's Jack Tretton was also keen to point out that PlayStation Move has "buttons" on it, in an attempt to differentiate Sony's offering from Microsoft's - while inadvertently making it sound like even more the blatant clone of Nintendo's Wii. For all the talk of precision and accuracy, new game Sorcery was exactly what we've come to expect from motion control games - a character running around a 3D environment slashing away at angry-looking bad things. But compared to Microsoft's basic-looking collection of Kinect demos, PlayStation Move did indeed look more impressive. The chap controlling the Sorcery demo waved his arm around above his head, and the in-game character followed. It wasn't a rough approximation of the movement, it was a 100% accurate recreation of the guy's windmilling. It was almost enough to convert a cynical person to the possibilities of motion-tracking games - if the game itself didn't look like such a by-the-numbers 3D action product. Tiger Woods then completed his rehabilitation into the corporate scene by being chosen as the in-game character to demonstrate the PlayStation Move support that'll be part of this year's EA Tiger Woods game. It looked incredibly hard to play. Even the developer - who made it - was struggling to hit the ball off the tee, with the precision offered by PlayStation Move making the Tiger Woods game much, much more like real golf. Might be a good thing, might just ruin the feel and send everyone back to their reliable Dual Shocks. PlayStation Move functionality for the next Tiger Woods game will arrive as a downloadable extra through PlayStation Network, with a Move-enabled teaser also appearing on a demo disc that'll be bundled with the controller itself. Move has a UK release date of 17 September, with 15-20 games ready from day one - and they'll be priced a little cheaper than "normal" games. We'd also been expecting Sony to announce a paid-for online service to complement or perhaps even replace its existing free PlayStation Network online gaming area, and we got one - in the shape of PlayStation Plus.